Take, for example, last week’s brutal attack on Michelle Wilkins, the young mother in Longmont, Colorado, who was lured to a home through a CraigsList advertisement for children’s clothing. Upon arrival, she was assaulted with a knife and her seven-month child was cut out of her womb. The mother survived, the then-viable baby did not. The State of Colorado, not sure how do deal with this deceased “product of conception,” opted against murder charges because to do so would be to make a real connection between a “product of conception” and a baby. Such a connection must be avoided, feminists recognize, because it would undermine much of their justification for abortion, the holy grail of their financial and political movement. This grotesque response to Wilkins’ unborn baby gives lie to all that chatter about “every child a wanted child.” Surely Michelle Wilkins wanted her child and didn’t intend a late-term abortion since she was on a mission to procure baby clothes. Wasn’t her daughter a baby and wasn’t she intentionally killed? And isn’t the intentional killing of a person—however young or old—considered murder? The NIH site seems to be saying that an embryo fertilized outside the woman’s body, provided by those who have donated their eggs/sperm (usually at a profit), is fair game for all manner of testing and manipulation. But what is it about the location of the act of fertilization that is significant? If the in vitro embryo is implanted, grows in utero, and is born, certainly the petri-dish origin doesn’t mean that the child isn’t a person. Does that mean the embryo is not a baby (embryo, by the way, is basically the Latin word for “very small baby in the womb”)? Or does it mean that one can do with it what one wants because the embryo is disconnected from a woman? I’m confused because much of the argumentation around abortion rests on the premise (and oft-stated slogan): “My body, my choice.” But if these little ones are outside the womb, apparently they are fair game in the way they wouldn’t be if they were in the womb? Wait, what? This seems simple enough but tough cases, according to feminists, defy this tight logic: the suffering couple, the pregnant undergrad who wants to finish college, the Parkinson’s patient who wants a cure, by their emotional appeal to our senses trump the reality of the child who is too small to be seen, heard, touched, or smelled. The focus on tough cases is not the problem. In fact, it is both natural and laudable. Part of the feminine genius is to have the acumen to help those in tough situations. Women in their intuitive wisdom and compassion know that those who are hardest to love need the most love, and they find ways to love and heal them, instead of wounding them further. Perhaps women (including feminists) are hardwired to find emotional arguments more compelling instead of the purely logical or tidy legalism to prevent society from neglecting those in most need? What feminism has done, however, rather than see the difficult cases as a call to greater love, care and creativity, is literally thrown the baby out with the bathwater by trying to make the problem vanish. But killing the innocent, no matter their size, never heals; it simply hides and widens the wounds. The net result of feminism, instead of equality, has been to twist our minds into pretzels by demanding allegiance to the contradiction of the law of non-contradiction: “A baby is a baby unless it is slated to be aborted or exploited, and then it is not a baby.” Or we are compelled by an emotional plea to defend the indefensible:the killing and exploitation of our own children simply based upon location, size or desirability. No wonder there are so few public debates about these issues. 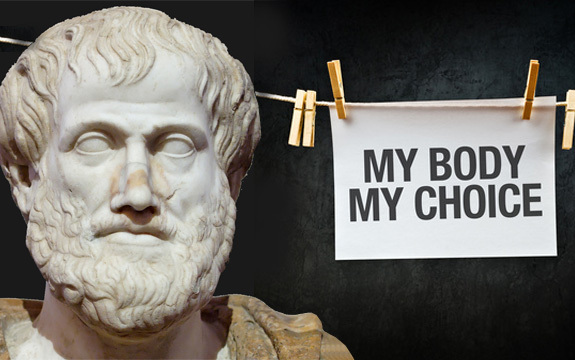 While science and Christianity (Christianity is the only major religion to recognize the equal dignity of women and men) have proven Aristotle wrong, what feminism has wrought is not deformed males, but deformed females. They are bereft of that which has been part and parcel of their genius from the beginning: their wise intuition, maternal touch, and self-less giving, while also refusing to properly use of their intellect. Until these gifts are valued as different though equal in dignity to those given to men, female deformation will continue to wreak its havoc on everyone, but particularly upon the smallest among us.